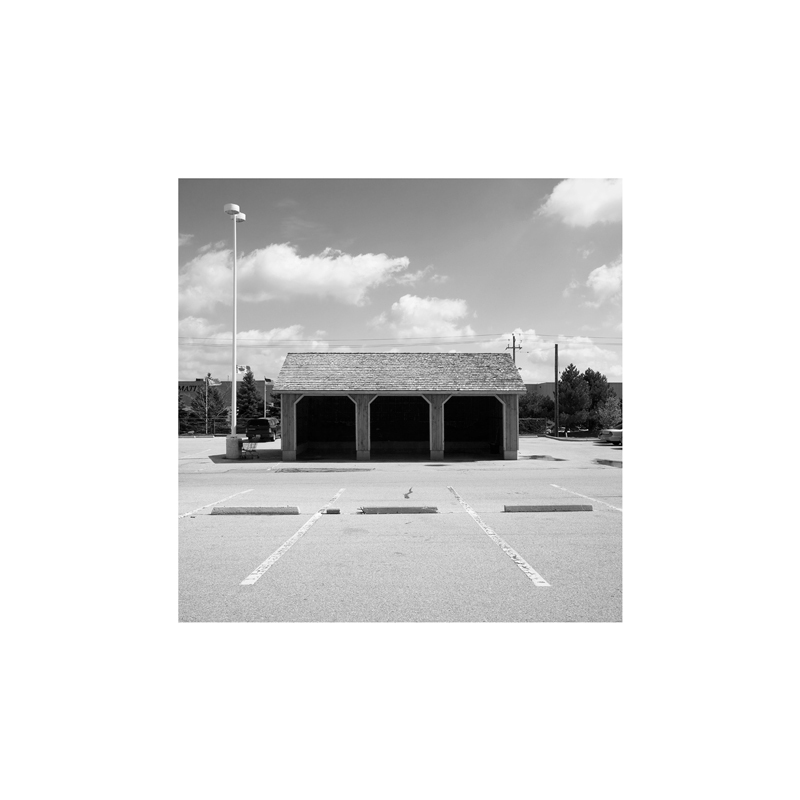 "Andrew Wright’s two works, Mennonite Stable in the north Waterloo Home Depot parking lot, c.1998 and Helix: City of Kitchener parking garage at Duke and Ontario streets, 1967 touch on the region’s relationship to transportation and modernity. Mennonite Stable in the north Waterloo Home Depot parking lot, c.1998 explores the relationship that Waterloo citizens have with the Mennonite community. Wright photographed one of the contemporary stables and hitching posts offered to accommodate horses in the city. Increasing urbanization pressures present challenges for Mennonites, including traveling by horse and buggy on busy highways. This photograph captures an example where a modern business has adapted to Mennonites’ modes of transportation. 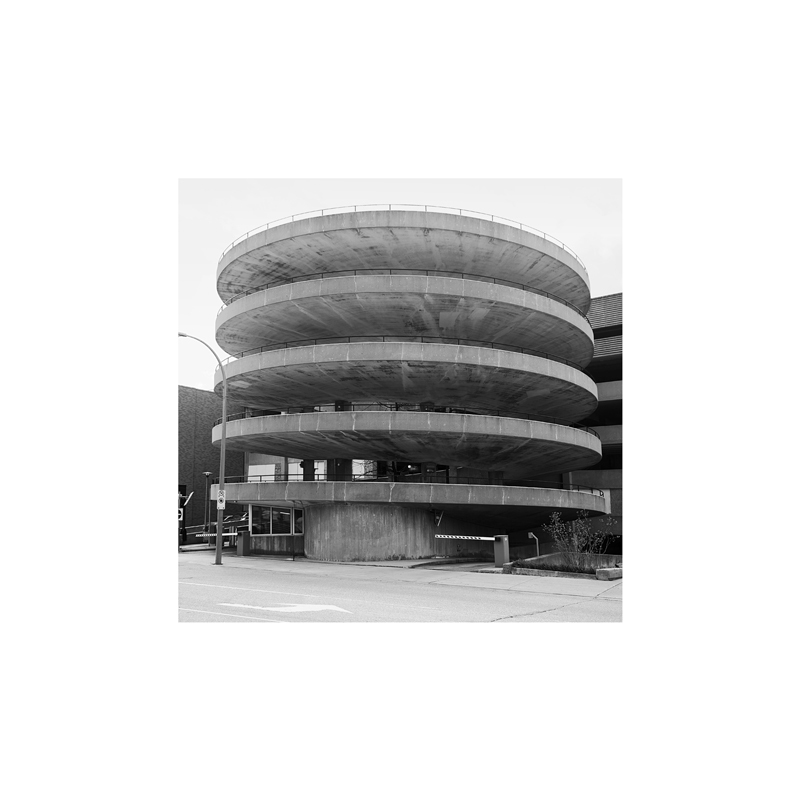 The parking lot in Wright’s second photograph, Helix: City of Kitchener parking garage at Duke and Ontario streets, 1967 endures as a monument to modernity. In 2009, the parking lot was featured as part of a futuristic city in an Audi commercial. With its resemblance to Frank Lloyd Wright’s Solomon Guggenheim Museum , the parking garage seems strangely out of place – and out of time – with its surroundings. According to Wright, 'Both of these images present anachronisms. The stable’s architecture harkens back to an earlier time yet was built recently. The parking structure was built in 1967 yet persists as a futuristic vision.' "